Assuming that most of you follow me on Twitter, twitter.com/samiusgurobo if you don’t. Or we are friends on Facebook or have at least dropped by and check out the DDo podcast i do at DDoCocktailhour.com lately, you should know that i have been following another person’s build for this last life on Samius. Geoff Banana Hanana’s FeyBuckler. I have tweeted him updates as i have been playing. Thinks i have learned along the way and tweats i think work best for the build as i see the game. My jaded jaded version of the game. He has even written a follow up or two on the build, which you can read here. And i think he wants to know, is the build good? I will try to answer that at the end. But i want to touch on my changes vs his according to a couple of screen shots. Some easy things to notice changes, i have about 12 more PRR and about 7 more Double Strike. It is not shown but i would bet i have a little more Melee power also, but either of us chose to hover over that break down. Some things that might not jump out at you is he has a few more HPs and i have a lot higher AC (which is meaning less anyway). I assume do to destiny and twist of fate choices. Also i have “geared up” for level 20-22 something i am not sure Geoff has a ton of level 20 gear ready to go. Oh and one last thing he has a lot more Sonic power then i do/did. I will talk about that is a moment also. I think Geoff is in Crusader based on his posts, a great choice for this build. I am in Fate singer, a much less good choice but i need to fill my arcane sphere this go around so that is why i am singing vs being in a “good destiny.” But even so i feel unstoppable in most quests. The only time i have died at near level quests were 1, against the ballista’s in Storm the Beaches, i was shot from behind which started a bit of a chain reaction for a moment but was able to pull out of thanks to a rez cake and the strength of the build and teamwork of my leveling partner ie the wife. 2, I pulled the lever in Von3 almost lived died at like -40 or something, btw like a lot of players i am a EE player first time through…. So there is some challenge in what we are doing, it is not like we are just running by on EH. And we are doing well. Like very well. I think that most of that is on the strength of the Warlock class. Having said that, watching the wife, Grim and the rest of the guild play their Warlocks had i played one straight, i would have TRed right away. I did the spam damage spells thing for long enough with the Magic Missile wizard, Sorc, Ranged builds even the no DC having divine casters and i am done with that play-style for a while. But this build is different. A change i need and have been trying to have for awhile. My last live was a Fvs/Pally. It was a lot of fun also and i could do things solo on EE also but it was a lot of work all the time. Check this attack that, do i need a heal? Make sure this buff is running, etc. It was just a lot of work for not as much payoff. This build does all the things i want my melee to do. AOE damage just by being around, some healing, most important skills covered and solid damage. Not great melee damage but good enough. Add in the Aura ticks and the damage is more then fine. I am even looking forward to having perfect weapon fighting thanks to Reign and other bard powers. Gearing this version of Samius is hard. Most of the gear that is best for this build is not stuff i have just laying around. I made a Epic Red dragon suit of armor just to have something light to wear that is not robes. I have been using my green steel weapons since level 12. And had Tobril not talked about the Blade of the High Priestess, i would still be using them. I did swap to the Blade of the High Priestess, for general mobs. Mostly thanks to Potency +72 boosting my sonic power to the levels Geoff is talking about in his posts. A proper Drow Light Mace of the Weapon Master might be more damage over all but i like what this is doing for now. And i have a Celestia when ever the wife is ready to level up as well as 2 raider’s chests in the event i decide i want a Balizarde. I haven’t decided yet. Overall, the build in epics so far is really solid. I don’t mean that as anything but the highest of complements. I have played everything from glass cannons to max dps i could muster ranged builds that can solo most EE quests to the support healer that feels that leveling is easy. Wack a mole with Hps is easy in epics, if they die just rez them and move on. Not to say there aren’t short comings in the build. It would be great to have rogue skills. But to get them you would have to lose the fighter levels which are amazing. You wouldn’t think that they are great but they are. The saves need work, but i am me so i will fail saves no matter what. And you could use a few more 100 hps fairly early into epic elites if you really want to tank bosses. But that is not a huge deal breaker for me. If you asked me for a grade of 1-10, i would say this is a 9ish. And here is the kicker. I was looking for something to rock a few epic lives with, i need a few more here and there to finish my epic completionist. And i had planed to do so with that FvS/Pally build. But i needed the heroic completionist feat (+2 to all stats was huge for the build) and i lost it when Warlock came out making that build a lot tougher to play. I found Geoff’s build looking for a warlock that would itch the scratch that was bothering me and instead found something that i think will make the divine epic lives easy to complete. My plan is to level to 28, look at how the world looks then and epic tr and rock back up in Unyielding Sentinel or Divine Crusader. I suspect that the Sentinel will be a touch stronger to play in but maybe not. It is a fun build and i would much suggest checking it out if you can. Oh and thanks Geoff for posting this build. I think you are on to something great here and as i play it more and learn the ins and outs of the build i will refine things and keep sharing them with everyone, even if you move back to rangggger. I know it has been a while since i wrote a post last and i am sorry. I have just been so busy with work and other issues around here mostly dying. I don’t really know what hit me, but I am about 11 days past when i noticed the first symptoms and i am still only at 50% or so after a week of full on bed rest. I still get wore out just sitting at the computer. It was a beating. It was the worst i have been sick in a loooooog time. But enough of that lets look at some good things. Opened a Jace, Vryn’s Prodigy pack 3 in a store vs store event as i was crashing the other week. Wasn’t blue, drafted it anyway. Between it and the cards i hated (Store vs Store drafts are team draft like so hate drafting is important), i ending up needing to dip into blue for raw power. 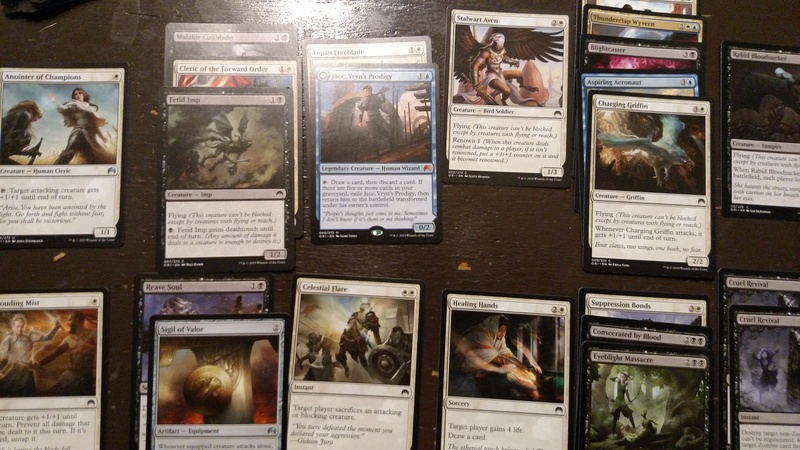 There was a black/white list but i had to fight for playables and had no real way to finish things. The blue added not only Jace but a handful of fliers taking my deck from no plan to air attack. Here is a pic of the final deck, sick as it is. Ended up undefeated. Turns out if you can flip Jace into his planeswalker form, any spell worth the flashback effect is amazing. You can’t tell from the image but that top card in the 4 slot is a Kytheon’s Irregulars. Also a nutty bomb if you didn’t know. I kinda feel bad for the guy on my left, my first pack was Kytheon’s Irregulars, Sentinel of the Eternal Watch, Swift Reckoning, Topan Freeblade in white with not that great other stuff. He took the Sentinel and then just got cut super hard. The pack back i was open for black cards and hate so he more or less got one pack in a main color and then got wrecked in the draft. Other then that life in the magic department has been simple. Like most brewers i am in a holding pattern until the next set comes out. I am working with a guy on getting a Magic themed podcast up and running. Think it will be mostly hosted here so no other url to watch. And Tobril and i should be able to tape sometime this week with him moving the next few weekends the meat of our Tiny House podcast should finally be underway. Then Lessah and i hope to tape this week also which should be good. Oh and i need to record something for the 400th DDOcast. Not sure what that will be but i am guessing i will dust of the old music and try to bring up some sweet Sound Concepts. 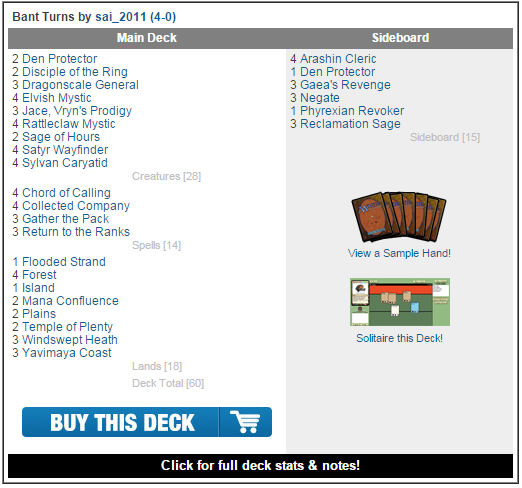 Guess it is good that Magic is in a slump this week. Think that is it for tonight. I will be brewing all week for FNM this Friday. Should be a quite one as most of our more competitive players are heading to the GP in OkCity this weekend. That should just leave things to us more casuals….